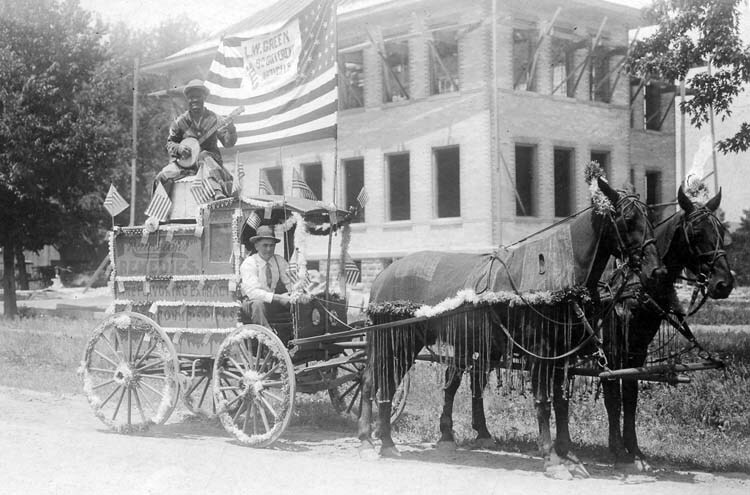 this peddlar and his wagon, horses, and musician all appear to be decked out for a parade; the sign on the flag says, "L.W. Green Sells 90 Different Articles," and the side of the wagon is painted with "Rawleigh's Remedies," "Fine Flavoring Extracts," something ("Horehound," perhaps?) obscured by the decorations, and "Spices"
Jennifer, I love this photo! Would you mind if I were to use it in a business presentation of mine about the history of selling? Regardless, thank you for finding and posting it. As it’s an old, found photo, I don’t mind!